Fujifilm has announced the details on its 100-200mm telephoto zoom for its GFX range of medium format digital cameras. 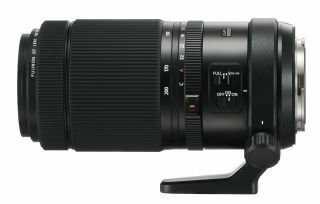 The Fujinon GF100-200mm F5.6 R LM OIS WR becomes the eighth lens in the GF range – and offers an effective focal length range of 79-158mm when compared to a full-frame camera (the medium format sensor gives a crop factor of 0.79x). The image stabilised lens is made up of 20 lenses in 13 groups. This includes two super ED lens and one aspherical lens which reduces chromatic aberrations and field curvature aberrations to maximize image quality. The lens has been sealed in 10 areas for dust and weather resistance allowing users to shoot with stability in tough outdoor environments. Fujifilm sees this lens as a useful tool for landscape and nature photographers – but will undoubtedly will prove a favorite with portrait and fashion shooters too. The new zoom is not only compatible with the GFX 50S and the more recent GFX 50R, but will also work with the 100-megapixel GFX 100S which is expected to be launched later this year. The lens has been designed to be a perfect partner to Fujifilm's 1.4x teleconverter. The GF1.4X TC WR extends the telephoto shooting range to 140-280mm (equivalent to 111-221mm in 35mm format), with a one stop reduction in maximum aperture. The lens will go on sale from February for £1799 / $1999.